“Data is the new oil!”. There is probably not a single CEO out there who has not said this sentence before. In this blog post we want to give a little context to what this buzz-wordy phrase means and how we as a company use data insights to create business value. In the first part of the essay we will look at general mechanisms of data-driven value creation. In the second part we will look into lidbot and how we use these mechanisms to create business value. First let us fully understand how data can drive monetary value for businesses. Therefore, we need to step back a little. A few weeks ago, during my vacation in New York City, I came across a perfect example on how a company can use data: Amazon Books — a physical store of Amazon, selling books. The pure existence of these stores was astounding to me as book retailing was the very first industry which was digitized by the company back in 1994. By selling books online the company drove many bookstores into insolvency. Looking back the reasons are obvious. Online shops enable a much broader offering of products without renting tremendously large spaces in mostly expensive neighbourhoods. They also provide custom data-driven suggestions to customers (“If you liked this, you might also want this one”) to increase sales. So why does Amazon suddenly open stationary shops — especially in one of the most expensive cities in the world? The reasonis: data! Apparently it does not need large book shops to fulfill customer needs. Amazon Books uses data to determine the books that aremost likely to sell in one particular store. The company has been around for ages and has collected a large amount of user data. Using this data, the company can create a slim and yet compelling offering of books in their stationary stores. And you can see the influence of data insights yourself! I have been to two shops in NYC. Their collections vary in each location. Placed books are carefully selected by customer preferences in the neighbourhood. For example, the store in the shops of Columbus Circle (a huge luxury mall near central park) has — surprisingly — a huge kids section, while Amazon Books in midtown Manhattan offers a large collection of business books. Data-driven suggestions for customers are provided in the stores as well. Amazon Books also offers delivery of your purchase to your doorstep, in case you do not want to carry your bag around yourself. All these innovations have one common goal: to provide the best customer experience within the smallest possible space. It sounds trivial but as it turns out you do not need to offer a customer hundreds of books to make him/her happy — just the ‘right’ one. With data, Amazon Books is able to decrease space and rental costs and subsequently increase its profits. For most conservative retail companies all this sounds like science fiction. And yet, due to incredibly detailed customer insights it is a reality. Until a few years ago, these data insights, at scale, were limited to customer-facing (aka B2C) businesses. From my perspective this rapidly changes with the (Industrial) Internet of Things (IoT). IoT is the sum of “objects with computing devices in them that are able to connect to each other and exchange data using the internet.” (Cambridge Dictionary). There is a popular misconception that business value gets created in IoT by connectivity alone — I disagree. According to a study from Deloitte, value is created when information (read: data) is utilized to modify actions in beneficial ways. Ideally, this then creates a loop of further data generation that can be analysed again. The consultants call it the “IoT Information Value Cycle”. 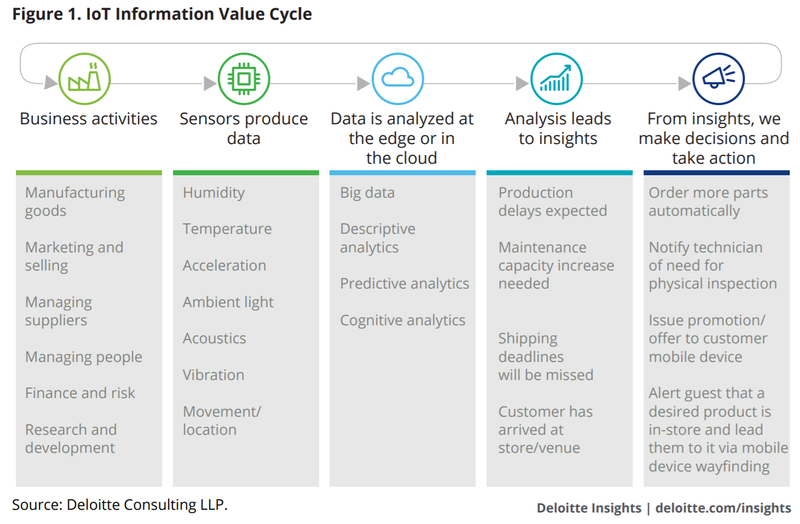 In the IoT Information Value Cycle a business activity comes first. This can be anything from manufacturing goods to selling a product to customers. In our case, we are talking about efficiently emptying waste bins. In order to generate valuable data these analog activities are equipped with sensors. lidbot is an IoT hardware device that measures real-time fill levels of waste bins. We are using reliable, low-cost sensors that can easily beadded to waste bins. Data is generated with lidbot sensors. This data is then analysed (typically in a cloud-based analytics engine) which produce data-insights. These insights, let’s say the finding that a waste bin is emptied to often, result in actions being taken (“data-driven decision making”). These actions then improve business activities and more business value is created.Of course, to enable data-driven modifications of business activities data, connectivity is needed in the first place. However, business value is not created by data but by data insights that influence business activities. For this to work data integrity is an important building block. Therefore, we are deeply convinced of the IOTA protocol — a disruptive distributed ledger technology. To give an actual, practical example, let’s look at how lidbot created value in our recent Proof of Concept (PoC)with Taipei City Hall. At the beginning of the POC period, sensors were installed into 24 waste bins in Taipei City Hall building to track fill-levels of each bin in real-time. What we found is that bins were being changed too often. The sensors collected critical insights about the waste collection habits of all the staff. The sensors not only monitored the fill-levels of the waste and recycling bins but also monitored how often these bins were being changed. The sensors were able to recognize when a bin had been changed when a large drop in fill-level was uploaded. The timing of these significant drops in fill-level were identical each day for the entire 90 day POC period. Most times these scheduled changes happened when the bins were not even half full, proving to lidbot’s team that optimizations were needed. By using data we can improve waste management at Taipei City Hall. The expected costs saving are about $548,100 NTD ($ 17,800 USD) saved per year in employment costs. In a smart city context, in which every bin of a city is equipped with lidbot sensors, the impact becomes much bigger. Here, not only can employment costs be reduced but also fuel expenses — by enabling more efficient route planning of garbage trucks. Moreover, well-thought-out waste management is a key requirement to improve the well-being of citizens and reduce environmental pollution. The IOT sensors that lidbot provides enable both businesses and cities to not only optimize their waste collections by reducing the amount of times staff are sent to change waste bins, but also by recognizing problem-areas where bins are getting filled too often. Areas, in which this happens, usually require a second bin to be added nearby to offset incoming waste and recycling. For some clients, optimizing the cost of collection may not be the primary reason for installation. Hotels, for example, may use these sensors and insights to better their guest’s experience. These sensors can ensure no guest ever sees a full waste bin. For enterprise clients, lidbot’s sensors can be used to transparently report into waste audits. Because lidbot uses IOTA’s distributed ledger, it is able to provide immutable, trustworthy waste data to allow for enterprises to transparently report on their quarterly or yearly waste statistics. In this essay we highlighted the disruptive potential of data-driven insights. Amazon Books, a best practise in the B2C market, uses data to improve customer experience. In the age of IoT B2B market, participants are also able to use data to their benefit by using it to improve business activities. At lidbot we use data to increase transparency of waste management in cities. We are only at the starting point of our mission and are excited to contribute to an environmentally friendly smart city of the future.